Dress your pup in this Baby Bear Girl Tee handmade by Hello Doggie for the cutest look ever, perfect..
Give your puppy a wardrobe must have with this Striped Baby Tee by Hello Doggie. Tee's are made of c.. Style your pup in this adorable "Dog" applique tee by Hello Doggie.Tank available in Pink or AquaTee..
Service dogs deserve to express their style too! Let everyone know that your dog is a service dog wi..
Let your pup show their patriotism with our new Born in the USA Dress and Tank!Clothing features spa.. 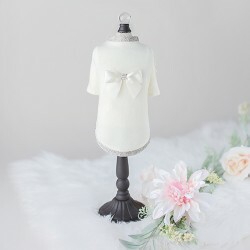 The Dainty Bow Tee handmade by Hello Doggie features elegant tiny and dainty bows embellished along ..
Diamonds have always been a girl's best friend! The Diamond Girl Tee handmade by Hello Doggie is emb.. Fabulously stylish for the four-legged fashionista! Constructed of soft cotton fabric, our classic s..